Alfred Wegener collected diverse pieces of evidence to support his theory, including geological “fit” and fossil evidence. It is important to know that the following specific fossil evidence was not brought up by Wegener to support his theory. Wegener himself did not collect the fossils but he called attention to the idea of using these scientific doc uments stating there were fossils of species present in separate continents in order to support his claim. Illustration showing similar rock assemblages across different continents. Geological “fit” evidence is the matching of large-scale geological features on different continents. It has been noted that the coastlines of South America and West Africa seem to match up, however more particularly the terrains of separate continents conform as well. 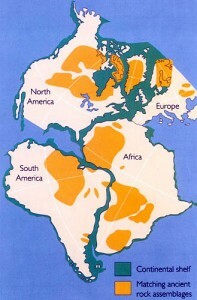 Examples include: the Appalachian Mountains of eastern North America linked with the Scottish Highlands, the familiar rock strata of the Karroo system of South Africa matched correctly with the Santa Catarina system in Brazil, and the Brazil and Ghana mountain ranges agreeing over the Atlantic Ocean. Another important piece of evidence in the Continental Drift theory is the fossil relevance. There are various examples of fossils found on separate continents and in no other regions. This indicates that these continents had to be once joined together because the extensive oceans between these land masses act as a type of barrier for fossil transfer. Four fossil examples include: the Mesosaurus, Cynognathus, Lystrosaurus, and Glossopteris. Modern day representation of the Mesosaurus. 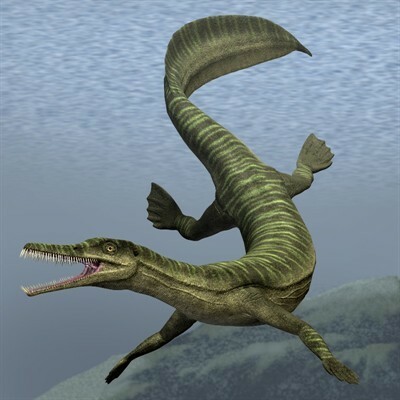 The Mesosaurus is known to have been a type of reptile, similar to the modern crocodile, which propelled itself through water with its long hind legs and limber tail. It lived during the early Permian period (286 to 258 million years ago) and its remains are found solely in South Africa and Eastern South America. 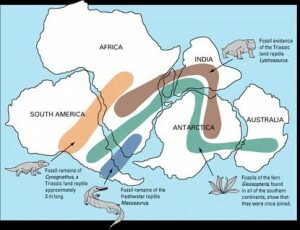 Now if the continents were in still their present positions, there is no possibility that the Mesosaurus would have the capability to swim across such a large body of ocean as the Atlantic because it was a coastal animal. Modern day representation of the Cynognathus. The now extinct Cynognathus, which translates to “dog jaw”, was a mammal- like reptile. Roaming the terrains during the Triassic period (250 to 240 million years ago), the Cynognathus was as large as a modern wolf. Its fossils are found only in South Africa and South America. As a land dominant species, the Cynognathus would not have been capable of migrating across the Atlantic. Modern day representation of the Lystrosaurus. The Lystrosaurus, which translates to “shovel reptile,” is thought to have been an herbivore with a stout build like a pig. 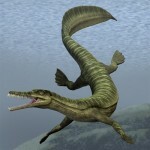 It is approximated that it grew up to one meter in length and was relatively dominant on land during the early Triassic period (250 million years ago). Lystrosaurus fossils are only found in Antarctica, India, and South Africa. Similar to the land dwelling Cynognathus, the Lystrosaurus would have not had the swimming capability to traverse any ocean. Modern day representation of the Glossopteris. 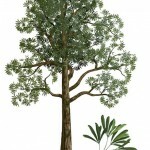 Possibly the most important fossil evidence found is the plant, Glossopteris. 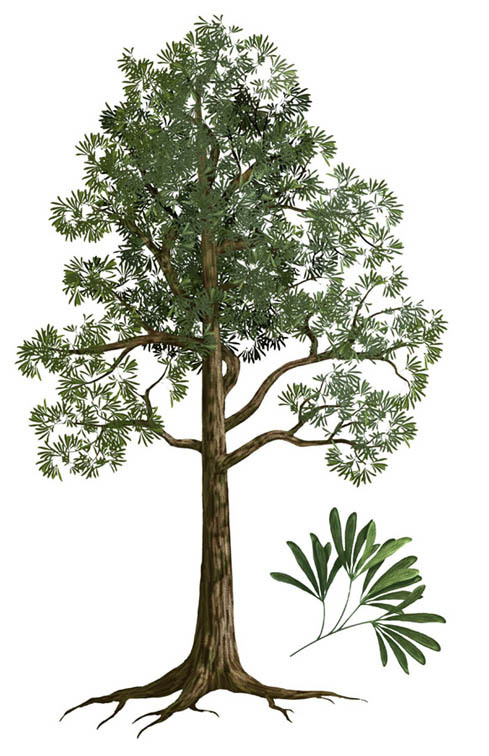 Known as a woody, seed bearing tree, the Glossopteris is named after the Greek description for tongue due to its tongue shaped leaves and is the largest genus of the extinct descendant of seed ferns. Reaching as tall as 30 meters, the Glossopteris emerged during the early Permian period (299 million years ago) and became the dominant land plant species until the end of the Permian. The Glossopteris fossil is found in Australia, Antarctica, India, South Africa, and South America—all the southern continents. Now, the Glossopteris seed is known to be large and bulky and therefore could not have drifted or flown across the oceans to a separate continent. Therefore, the continents must have been joined at least one point in time in order to maintain the Glossopteris’ wide range across the southern continents. Description showing the fossil locations of the Mesosaurus, Cynognathus, Lystrosaurus, and Glossopteris spread across different continents. If the continents of the Southern Hemisphere are put together, the distribution of these four fossil types form continuous patterns across continental boundaries. Of course, possible explanations are brought to attention. One explanation is the species could have migrated via a land bridge or swam to the other continents. However, a land bridge is not applicable due to the differences in densities between the continents and oceans floor and violation of the isostasy concept. Moreover, swimming as a possibility is foolish due to the lack of formidable swimming capabilities to travel across such an extensive body of water like the Atlantic. An additional resolution is that the species could have merely evolved separately on the other continents. Undoubtedly, this interpretation is in complete disagreement with Darwin’s evolution theory.